When most people think of sports medicine, they automatically think of professional athletes or people who spend most of their waking hours at the gym working to chisel their physique. However, you don’t have to be a pro or a bodybuilder to see a sports medicine doctor. The fact of the matter is that many people could benefit from sports medicine in Chicago, but not many people understand what it is or why it’s beneficial. That’s why the experts at Chicagoland Complete Healthcare have come up with this guide to sports medicine. Sports medicine is exactly what it sounds like: medicine that is focused on sports. Sports medicine is aimed at preventing sports-related injuries, as well as diagnosing and treating them. It also consists of training, which includes workouts and exercises, nutrition and sports psychology. What makes a sports physician different than a primary care physician? When most people sprain their ankles or develop tennis elbow, they make an appointment with their primary care physician. However, these are the perfect injuries for a sports medicine doctor to address. Why? Because sports physicians undergo specialized training and education that focuses specifically on these and other sports-related injuries. 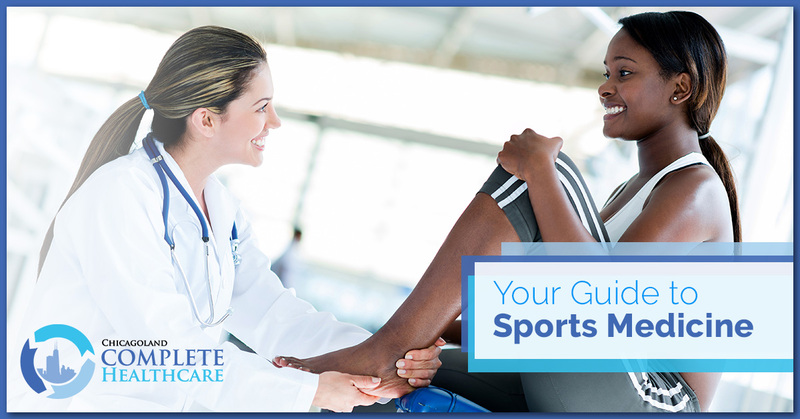 And, while your primary care physician can help to treat basic, sports-related injuries, if you have a more complicated injury related to overuse or training, or a chronic injury, it’s a good idea to turn to a sports physician. When should you see a sports doctor? Many sports-related injuries can be treated at home using the RICE (Rest, Ice, Compression, Elevation) method, which helps to reduce inflammation and eases pain. However, for injuries that are more severe or chronic, you’ll want to see a sports doctor. Chronic injuries tend to be from overuse. These include shin splints, tendonitis and stress fractures, and they commonly result from improper stretching, repetitive movements or gear problems. And, while using an ice pack can help to relieve your pain temporarily, it won’t provide you with long-term relief. The biggest benefit of turning to a sports medicine doctor for chronic injuries is that, not only can they help you to treat the injury and find relief, but they can also help you to correct the issues that caused the problem in the first place, as they are typically caused by improper movements. Sports physicians can help you to learn to train and perform properly — helping you to find the long-term relief you need. Turn to Chicagoland Complete Healthcare for sports medicine in Chicago. Now that you know what sports medicine is, how a sports physician differs from a primary care physician and when to see a sports doctor, it’s time to get the care you need. At Chicagoland Complete Healthcare, we have both primary care physicians and sports doctors on staff, ensuring that you’ll always get the care you need. And, regardless of whether you schedule an appointment to see our sports doctor, women’s health doctor or primary care physician, you can rest assured that we will always be a true advocate for you and your family. Schedule your appointment today.